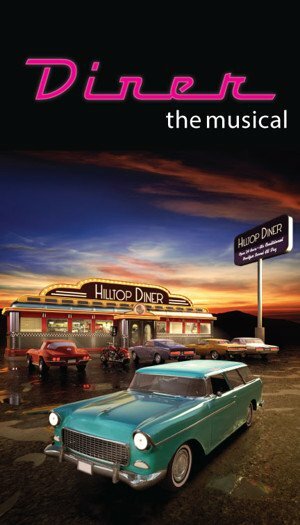 Based on Academy Award and Emmy-winning Barry Levinson's critically acclaimed and very popular 1982 retrospective coming of age film of the same title, a singing and dancing version of Diner, set in 1959 Baltimore, is now under development for Broadway. The is in its second round of preview performances at the Signature Theatre, Wilmington, Delaware, near Washington, DC, and closed there January 3rd, 2016. However, neither a Broadway opening date nor a theater for the show have yet been announced. It has been reported that an announcement of a Broadway opening is being delayed indefinitely by the Schubert Organization, which is interested in Diner, because Schubert does not want it to compete with the current success of the show, Waitress. The story is about six high school pals who reunite just before the wedding of one of them at the one place they know they'll always belong: the local diner. Now in their twenties, the friends have stumbled into adulthood and struggle to keep from growing apart. While faithful to this group of guys that the movie focuses on, the stage version, however, expands the roles of the women, as they begin to want more than a tidy life behind an apron, setting the stage for the beginnings of the wave of feminism that would soon arrive on the American scene, and the young men are confused about what that means. The show features a rocking score of 17 original songs written by Grammy Award-winning singer-songwriter, Sheryl Crow, with a sound that is nevertheless, stylistically reminiscent of our music (like the immensely successful retrospective 1972 Broadway musical, Grease). It is directed and choreographed by Tony-winner, Kathleen Marshall. Washington Post: " ... It would be a fine thing if 'Diner' found its footing, lived longer and prospered." Baltimore Sun: "It's a modest, unassuming, slyly affecting work with a book by Levinson based on his screenplay, music and lyrics by Sheryl Crow. Even people who don't know the film, or don't hold it in high regard, should find themselves easily drawn in and continually engaged. ... the world premiere production certainly gives the piece a stylish and vibrant launch. ...on the whole, the transformation from screen to stage has been handled in a telling fashion, preserving the essence of the original and adding effective spice. It adds up to a substantial new musical that has been given a thoroughly satisfying production. It's cool to hang out in this 'Diner.'" DC Metro Theater Arts: "For those wanting a musical to recall the heavenly days of doo-wop harmony groups choreographed girl groups, and the wonder years of early rock-and-roll, ... there is much delight. ... The music gives the audience plenty to smile about; or maybe dream about their own life lived." Washington Life Magazine "Crow ... has created a score that successfully respects and recreates the sounds of that “rock and doo-wop” era."